In 2015, the Archives and Special Collections Center received a donation of research materials from Seton Hall Professor Emeritus Daniel J. Leab. Dr. Leab taught in the history department for over thirty years, and over the course of his career he has served the University as director of the American Studies program, chair of the History Department, chair of the Rank and Tenure committee, and founder and director of Seton Hall’s Multi-Cultural Program. The materials in this collection were used by Dr. Leab in his research on various topics, including the Cold War, American communism, the American labor movement, the history of the FBI and the CIA, and the history of film. 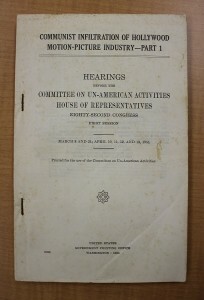 The majority of the collection is made up of books, most notably a nearly complete run of House Un-American Activities Committee (HUAC) reports. The HUAC materials represent years of hearings based on the alleged subversive activities of private citizens and they seem to symbolize the climate of fear and suspicion during the Cold War era. Included in the HUAC reports are the controversial Hollywood investigations, in which many members of the entertainment industry were subpoenaed based on alleged communist activities. HUAC report on communist infiltration of the motion-picture industry. The reports, printed by the U.S. Government Printing Office, had only paper covers and were bound by two staples driven through the pages near the spine. Some of the HUAC reports in the Leab collection were combined into large volumes and sturdily re-bound, with a decorative marbling effect applied to the exposed edge of the pages. 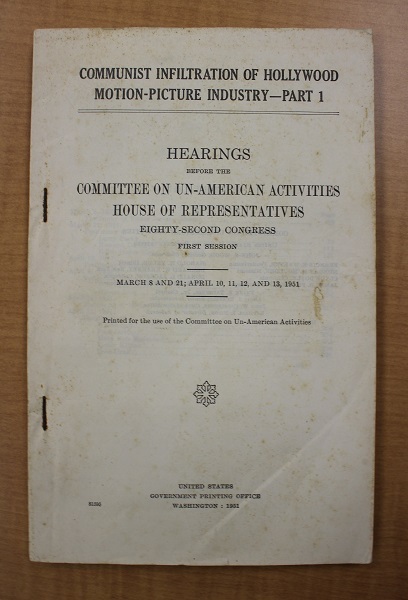 The collection contains many additional books which address the Cold War era, providing rich context for the HUAC reports and exploring other aspects of the time period, such as Senator Joseph McCarthy’s anti-communist activities. In addition, there are a number of volumes on American labor relations. A full list of the books in the collection can be viewed in the Daniel J. Leab collection research guide. 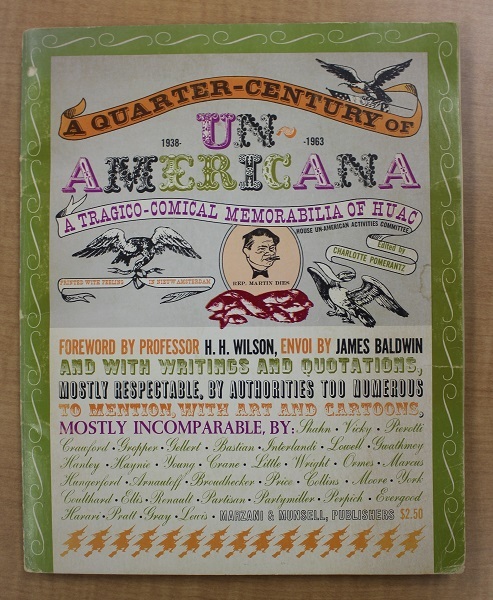 A quarter-century of un-Americana : a tragico-comical memorabilia of HUAC: This book of “Un-Americana” contains political cartoons and writings satirizing the House Un-American Activities Committee. As a supplement to the book collection, there is also a small archival collection containing publications relating to the Cold War and labor relations, and a number of photocopies from the American Heritage Center’s Louis de Rochemont collection, which Dr. Leab consulted while researching his book Orwell Subverted: the CIA and the filming of Animal Farm. A finding aid for the collection is available. 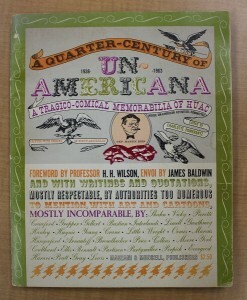 The Daniel J. Leab collection may be viewed by appointment in the Archives and Special Collections Center Reading Room. To make an appointment, please contact 973-761-9476 or archives@shu.edu. Previous Previous post: The Jacob I. Fass papers now available for research!